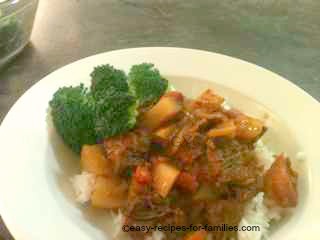 This easy beef stew recipe is another of my cheap quick easy dinner recipes. Slow cooked beef is delicious when cooked with cuts of meat like gravy beef or chuck steak. These cuts are inexpensive and are ideal when you're considering a family budget. Easy recipes like this gravy beef stew with a mustard sauce is a winner with my family as it has a subtle piquant flavor that is not too strong but is sufficiently different from the usual taste of beef stews. This makes enough for 4 serves of stew. This meal is ideal for freezing. Serve this yummy meal with plain, fluffy white rice. Beef stew requires a cut of meat that is suitable for slow cooking such as gravy beef or chuck steak. If you wish to add more liquid while the slow cooker is hot, be sure to add only very hot liquid. Adding cold fluids may crack the ceramic pot. To save time, I cut the meat into chunks with kitchen scissors right over the pot. Garnish with parsley or chives as desired. If you want your veg to retain some texture, don't cook them for this length of time. Add the vegetables 2 hours prior to serving and turn the heat to "High". 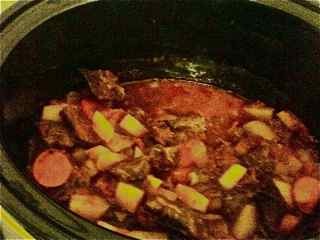 Your home will smell just delicious from the aromas of this slow cooker easy beef stew recipe. With these cooking fragrances floating around the house, my children call out " What's for dinner, Mum?" when they arrive home from school. It's very rewarding for a cook when you have an audience who can't wait till dinner time.